FILL a large pan with water and salt (or use a cube of vegetable stock for more flavor) and bring to a boil. PEEL the carrots and finely SLICE the flat beans and carrots. COOK them for a few minutes and then transfer them to a bowl using a skimmer and place them under running cold water. Bring the water to a boil again and COOK the pasta according to the package. Finely SLICE the spring onions and roasted red pepper. We used store-bought roasted peppers, but you can easily roast them yourself in a hot oven. When the pasta is cooked enough, you can DRAIN it using a colander and rinse with cold water until the pasta is completely cold. 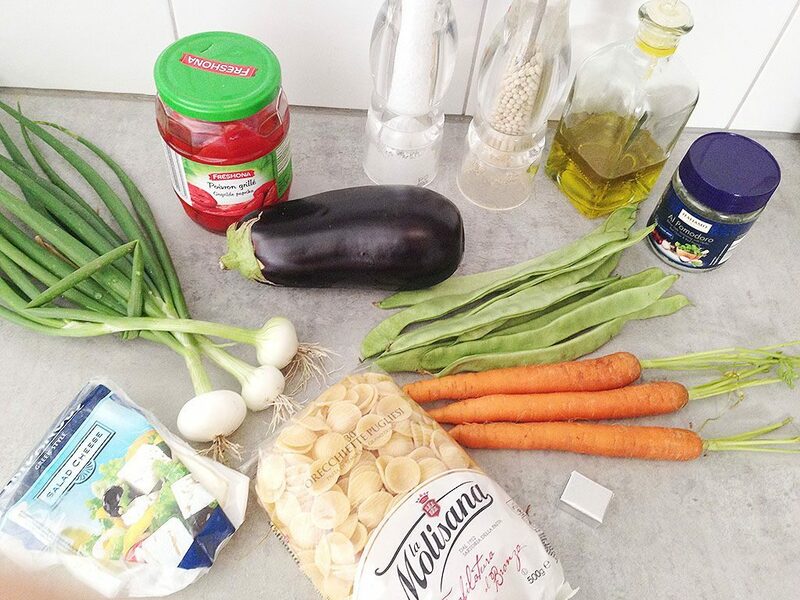 Use a mandoline or vegetable peeler to create long thin eggplant strips. HEAT a grill pan and coat the eggplant slices with olive oil. GRILL the eggplant on both sides until the grill pattern appears, that will only take about 2 minutes, depending on the thickness of the slices. TRANSFER them to a plate and season with pepper and salt. 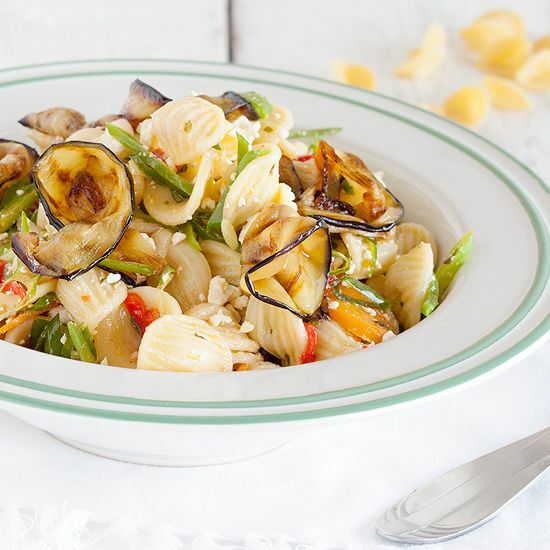 COMBINE the cold pasta with spring onions, roasted red pepper and cooked carrots and flatbeans. DRIZZLE with olive oil and toss well until everything is coated. 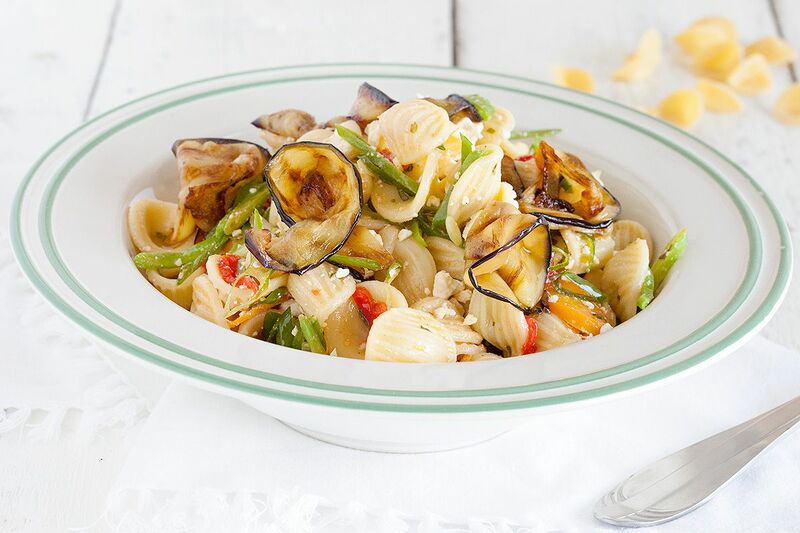 CRUMBLE the feta and add to the pasta, season with Italian herb mix, pepper and salt. 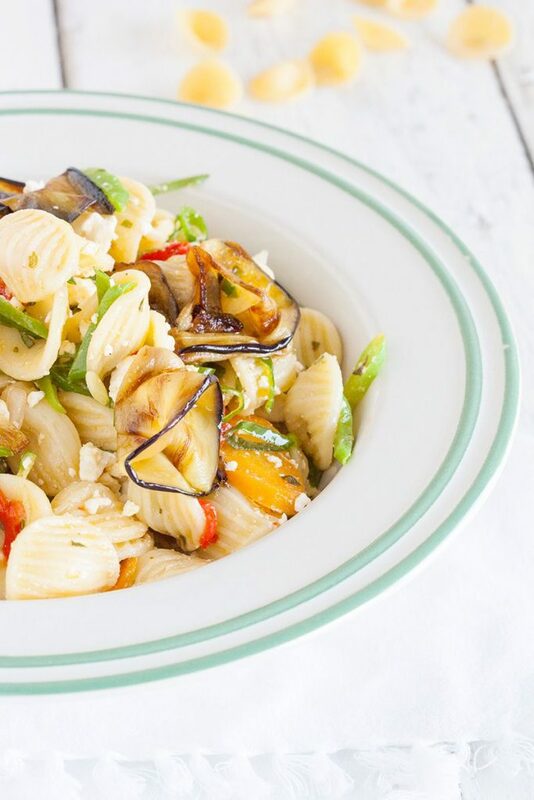 Serve the salad with grilled eggplant slices and enjoy!